Backed by the skill and experience of our craftsman cultivated over the centuries, Nakagawa Gofun Enogu incorporate the modern technologies of pulverization and classification, and have succeeded in equalizing the average particle size of each Iwa Enogu branch number and establishing a standardization technology. We also adopt stringent color control processes, selecting ingredients with meticulous care in order to produce pigment which is robust and doesn't deteriorate easily with age. Firing is a process used to make Shin Iwa Enogu, in which a metal oxide with good color forming ability is dissolved into a glaze constitute. The base ingredient is heated and melted in an electric furnace at 800 to 1000 degree Celsius to create the block which forms the basis of the pigment. The fired block or natural stone is pulverized in a coarse crusher then broken down further using a sifter. 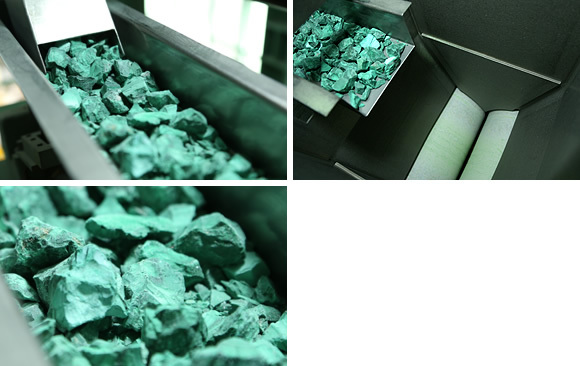 In the case of Tennen Iwa Enogu, the impurities contained within natural stones are removed in this process. The particle sizes of Iwa Enogu are indicated with numbers. As the number becomes smaller the particle becomes bigger and the color becomes darker. In contrast, as the number becomes larger, the particle becomes smaller and the color becomes lighter, closer to white. Particles are sorted using a process called "levigation" which looks at the difference in the rate of sedimentation in water due to particle weight. Nakagawa Gofun Enogu produces high quality products by performing the extremely cumbersome task of sorting particles into approximately 10 grades of coarseness by the repetitive, thorough motions of an automated process which has been developed based on the skills of our craftsmen. Gofun made from ground shells replaced lead white in the Muromachi period (1337 – 1573). The shells of Itabo oysters are the base ingredient of Gofun, which must be exposed to the elements for a period of 10 to 15 years, therefore Gofun is renowned for taking an extremely long time to make. 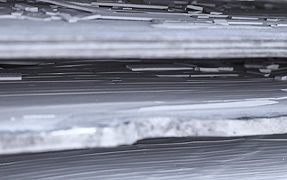 After the shells are sorted and polished, they are pulverized, but even this process consists of coarse, medium and fine pulverization stages, with stamping used as the medium pulverization method and the substance combined with water and put through a wet-type stone mill in order to preserve our traditional manufacturing techniques. Furthermore, repeated levigation is used utilizing the fact that different particles have different rates of sedimentation when immersed in water depending on particle weight. The substance is poured thinly onto boards and left out to dry under the sun, then knocked off the boards to remove. Apart from Nihonga, this Gofun deriving from the Itabo oyster is used to give traditional Japanese dolls their unique luminescent white faces and is recorded in ancient literature as the ultimate of Gofun. With Gofun manufacturing as our company’s origin, we will carry on the tradition faithfully with an uncompromising stance on materials and methods.